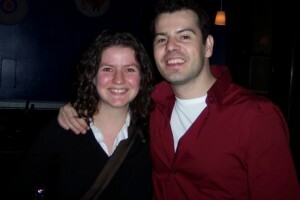 On January 9, 2006, not long after I had put together my first rough design of Confessions of a Pop Culture Addict, I posted this sentence in my journal: Jordan Knight, of the New Kids on the Block, is playing The Red Dog in Peterborough on January 31. Tickets are $20. No, this isn’t a joke. I am so totally there. When I was 13 or so, miserable, the least-cool kid in the village where I grew up, I was a super-huge fan of Jordan Knight and the New Kids on the Block.Â I had the requisite t-shirt, the wall covered with photos carefully ripped from the pages of Tiger Beat, and the Barbie Doll.Â I knew every word to every song.Â I had the Hangin’ Tough: Live in LA video, and we used to spend hours in the living room watching it and mimicking the dance moves. Â My sisters and I can probably still pull some of it off.Â In high school it became completely lame to like the New Kids, and I had pretty much worn out my ears on them, so while I still in theory liked them, I moved on with everyone else I knew to Pearl Jam and Cat Stevens (I went to an arts high school, so Cat Stevens was mandatory). But going back to 13-year-old me, I want to highlight something.Â I wanted to meet Jordan Knight so badly.Â I had never wanted anything so badly, and possibly have never spent as many years wanting anything so much in my life.Â Even though I knew if I met him I’d probably be paralyzed with nerves and have absolutely nothing to say, I still wanted it with a desire that was beyond my power to understand or control.Â It wasn’t a sexual thing, though I did have a big crush on him.Â It was just a longing that informed much of who I was for a couple of years, a focused intensity. So there I am, 15 years later, working as an arts administrator in Peterborough, an established artist and music professional in my own right, and the promoter tells me that Jordan Knight’s coming to town.Â And for all of my practiced calm, my cool collectedness, there was a flutter in my heart that I tried hard to tamp down.Â I told myself that I was excited ironically, like the cool kids, and that $20 was a small price to pay for that most delicious of mockable delights: the has-been. I also asked the promoter if he was in his right mind;Â I mean, Christ, the Red Dog?Â Don’t get me wrong; I’ve spent loads of evenings at the Red Dog, and before my time it was a seminal Peterborough venue, but right now it looks more like a country bar than anything else, and some of the sound equipment had a distinct ‘too many beers have been dropped on this gear’ sound.Â I couldn’t imagine this former pop prince hopping and strutting around on the Red Dog stage.Â In the weeks prior to the show, there was some malarkey and both the venue and the promoter changed: we were heading to the Trash. On the evening of the show, Sam and I headed over to the bar.Â Sam had gotten a hold of Jordan’s people, and though he was still in the early-days nervousness of being a professional writer and interviewer, he’d secured their permission for a short interview after the show.Â We were both giddy.Â The room started to fill; there were ten guys and about 200 girls, lots of NKOTB t-shirts, lots of of pretending we were here because we thought it was funny and not because OMG JORDAN KNIGHT!!11!! The opener was some light hip-hop act, good-looking but completely forgettable, and then Jordan Knight came onstage, and the whole place went slightly bananas.Â Everyone there knew every lyric (often better than Jordan did); everyone was transported back to that time, when we were all kids and all in love with NKOTB.Â Jordan… well, he was alright.Â He was off-key a fair amount, and was singing mostly to backup tracks with a DJ occasionally pumping up the crowd a little bit.Â He had relatively little charisma, seemed lost without a script, and his dancing was probably not as good as our living-room mimicry.Â Somehow it didn’t matter.Â None of us really thought that Jordan Knight was a particularly singular talent; it was a time in our lives that he symbolized more than anything. 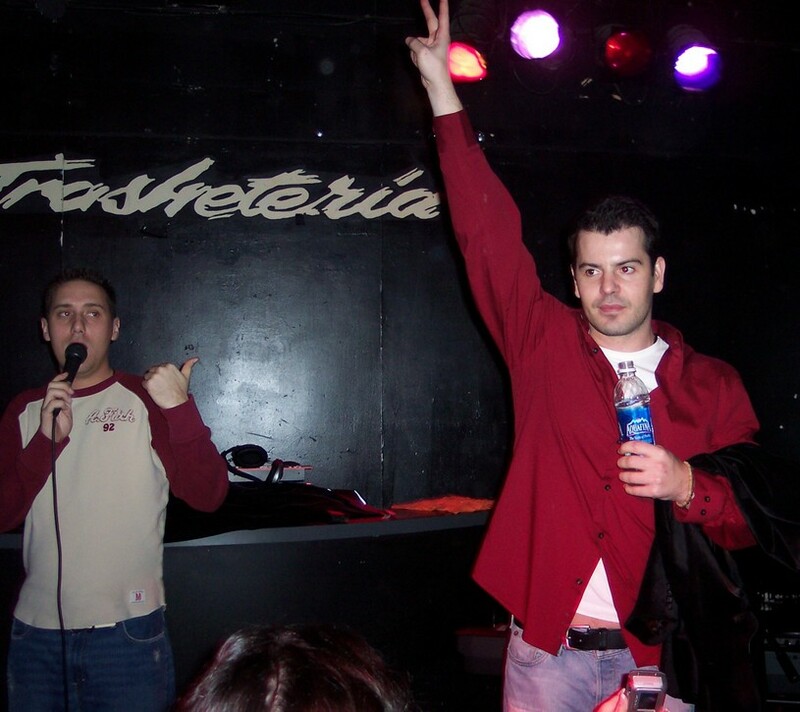 When the show was over, Sam talked to his people, and we bypassed the line of fans waiting for their $50 autograph and 60 seconds of face-time, walked into the Blue Room and found ourselves sitting on bar stools with Jordan Knight. Sam did his interview (read Part I, Part II); I made a couple of comments about my school-girl fandom (“Don’t call it a Barbie Doll.” he said with a laugh), and we took some photos, and then it was over and we walked out into the crisp night air on a giddy high. Dudes! I am totally standing next to Jordan Knight! What was said and who he is or isn’t wasn’t important to me then, nor is it now: I didn’t get an autograph, and wouldn’t even have a picture if it wasn’t for Sam.Â But over the coming weeks it began to occur to me that when I was 13, seeing the New Kids in concert was as likely as going to the moon, nevermind meeting Jordan Knight or him playing Peterborough or getting to sit down and talk to him.Â And I realized that if that could happen, so could anything, and that in fact everything I’d ever wanted could be on a slow journey towards me, taking its time because the greater the distance between myself and the things wished for, the more time it’d take to get them to me.Â If it took 15 years for fate to bring Jordan Knight to a bar 15 minutes from my house, then the job or the partner or the project I’d been longing for could be right around the corner, or at the very least on its way. Yeah, it’s a small thing, and maybe a silly one, but the great revelations of our lives don’t always come in a solitary canoe on a still lake, or in the expectant hush of a great cathedral.Â Sometimes they come because a fallen pop idol and a grown-up former fan cross paths in a slightly seedy student bar.Â And my mind keeps returning to this moment, especially in times when I need hope that all the hard (and sometimes thankless) work will pay off and the goals I’m striving for are worthwhile and reachable, and I think about the distance between an American pop star at the height of his career and a 13-year-old in an Ontario village, and I believe that really, anything’s possible. The key, I suppose, is to recognize your goals when you reach them and to still want them when you get there.Â And I think I’ve got that part down. I don’t go with the part about everything you (or anyone else) has ever wanted could be on slow journey toward you. But you make your own …success. I totally believe you are headed for that. The key, I suppose, is to recognize your goals when you reach them and to still want them when you get there. And I think Iâ€™ve got that part down. I think you’re right, you do have that part down. And I LOVE this picture of you, and your beautiful and ‘OMG look at me standing next to Jordan Knight’ smile.